For the province of Belgium, see Luxembourg (Belgium). "We want to remain what we are"
1. Not the same as the Het Wilhelmus of the Netherlands. 2. Before 1999: Luxembourgish franc. 3. The .eu domain is also used, as it is shared with other European Union member states. 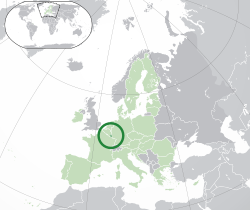 Luxembourg is a country in Western Europe; its official name is the Grand Duchy of Luxembourg (Luxembourgish: Groussherzogtum Lëtzebuerg, French: Grand-Duché de Luxembourg, German: Großherzogtum Luxemburg). It is a small country. It was one of the first countries in the European Union. It is also a member of the Benelux. The countries next to Luxembourg are Belgium, Germany, and France. Its population is 442,972. 963 - Luxembourg was founded. Sigefroid, Count of Ardennes, came to own the ruins of an old Roman fort called "Castellum Lucilinburhuc" ("Little Castle") from the monks of the Abbey of St. Maximin in Trier. 1354 - The emperor Charles IV made Luxembourg a duchy. 1437 - There were no people in the ruling family alive. The castle was given to the Habsburgs. 1443 - Luxembourg was captured by Philip of Burgundy. 1482 - Mary of Burgundy died. Luxembourg was ruled by the Habsburgs again. 1795 - After the French revolution Luxembourg was taken over by France. It became a département of France. 1815 - Luxembourg became a grand duchy. It was ruled by the king of the Netherlands. 1815-1866 - Luxembourg became a member of the German Confederation. 1890 - After the death of William III, Luxembourg passed to the House of Nassau-Weilburg. 1914-1918 - Luxembourg was conquered by Germany during World War I. 1940 - The Germans returned during World War II, and in 1942 Luxembourg became part of the Third Reich. 1944 - Luxembourg became independent in September because the United States Army arrived. 1957 - Luxembourg became one of the first six members of the European Economic Community. That is now called the European Union. Luxembourg is a parliamentary democracy lead by a constitutional monarch. Under the constitution of 1868, executive power is in the hands of the Governor and the cabinet, which consists of several other ministers. Luxembourg is divided into 3 districts, which are further divided into 12 cantons and then 116 communes. Twelve of the communes have city status, of which the city of Luxembourg is the largest. ↑ "Population: 511 840 habitants au 1er janvier 2011", Le Portail des statistiques: Grand-Duché de Luxembourg, 3 May 2011. (French) Retrieved 4 May 2011. ↑ 2.0 2.1 2.2 2.3 "Luxembourg". International Monetary Fund. http://www.imf.org/external/pubs/ft/weo/2012/01/weodata/weorept.aspx?pr.x=47&pr.y=10&sy=2009&ey=2012&scsm=1&ssd=1&sort=country&ds=.&br=1&c=137&s=NGDPD%2CNGDPDPC%2CPPPGDP%2CPPPPC%2CLP&grp=0&a=. Retrieved 19 April 2012. ↑ "Human Development Report 2011". United Nations. 2011. http://hdr.undp.org/en/media/HDR_2011_EN_Table1.pdf. Retrieved 5 November 2011. This page was last changed on 11 December 2014, at 04:01.